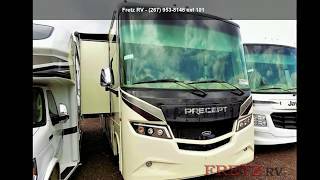 Hi, I am interested in your 2019 JAYCO Precept (stock #14414) listed on Autotrader for $105,823. I'd like to get more information about this vehicle and confirm its availability. This unit includes Jaycos Customer Value package & front overhead bunks. Jayco Precept class A gas motorhome model 31UL highlights: Triple Slide Outs Tri-Fold Sofa and Dream Dinette Pullout Kitchen Countertop King Size Bed Outside Entertainment Center with TV Let thisJayco Precept class A gas motorhomemodel31ULtake you across the country. You will find lots of floor space thanks to thetriple slide outsallowing you to move around the coach with ease. The convenience of the comfortableDream dinetteallows you to sit, dine, or even sleep at night since the dinette mechanism easily raises and lowers the tabletop. You can also choose to relax on thetri-fold sofa. You will appreciate more food prep space with the pull out countertop.And thekingsize bed gives you a space to unwind after a fun day of exploring or shopping.Theoutside entertainment centerwith anLED TVmounted on a swivel bracket and thesingle-disc DVD/FM radiooffer an additional living area when you prefer to be outdoors.There are additional features and options to choose from like the drop-down cab overhead bunk for more sleeping space, plus more! We are a top dealer for all 2018, 2019 & 2020 , Jayco Seneca, Greyhawk, Embark, Redhawk, Precept, Melbourne, Alante, and Prestige motorhomes in the Philadelphia, Pennsylvania, Delaware, New Jersey. Maryland, and New York Areas. These campers come on the Ford, and the Mercedes diesel sprinter chassis. These luxury motor homes are in the top of its class. These motor coaches are considered a class B+, C, A, & Super C. These high end luxury coaches come in various different floorplans. We also carry new Pleasure Way, Coachmen, Roadtrek, Hymer Carado, Leisure Travel Vans, Unity, Winnebago, Itasca, Sunstar, Sunova, Spirit, & Renegade Vienna Villagio. We also carry used and Certified Pre-owned RVs like Airstream, Tiffin Allegro, Wayfarer, Newmar, Freelander, Sunseeker, Fleetwood, Thor Motor Coach, Chateau, Hurricane, Bounder, & are always below NADA values. We take all types of trades. When it comes to RVs, we are your full service stop. With over 73 years in business, we have built an excellent reputation in the RV industry to our customers as well as our suppliers and manufacturers. At Fretz RV we have a 12,000 Sq. Ft showroom, a huge RV Parts and Accessories store. We added a 30,000 square foot Indoor Service Facility that opened in Spring of 2018. We have full RV Service and Repair with RVIA Certified Technicians. Bank financing is available for RV loans with a wide variety of RV lenders ready to earn your business. It doesnt matter what state you are from, we have lenders that cover those areas. We also have RV Insurance, RV Warranties, and RV Rental information available. We have detailed videos on RV Trader, RVT, Classified Ads, eBay, and Youtube. Like us on Facebook Check out our great Google and Dealer Rater reviews at Fretz RV. We are located at 3479 Bethlehem Pike, Souderton, PA18964 215-723-3121. Start Camping now and see the world. We pass RV savings direct to you. Call for details! Price does not include, Taxes, Tags, Title, Registration, doc fee, Prep, and Destination.